I was thinking about how much or how little “in the moment” a coyote is. I’ve noticed that a coyote is much less so than a dog. In fact, I think there is plenty of planning and forethought that goes on in a coyote’s day. Recently I saw a couple of coyotes ‘way across a park in the distance — they were running down a slope. Within five minutes one of them appeared in my vicinity. This coyote meandered a bit, hunting rather casually, and slowly made its way up to the top of a hill and over to the hill’s eastern edge. It remained there, sitting, checking out the area. Three walkers with calm, leashed dogs, walked by at sporadic intervals, and someone was sitting alone in the far distance, but otherwise there was not much activity in this area — the coyote watched all of this. For a short part of the time the coyote’s ears were in a low position and out to the sides, pivoting a little but not much. I’ve seen the low-ears-out-to-the-side when a coyote was preparing to defend itself and I saw it once when a coyote was in lots of pain from a leg injury. In this case, even though all the dogs were calm and leashed, I know that one of the dogs had previously chased this coyote. This may explain the low ears, if indeed that is significant. Up to this point, the coyote’s behavior was very casual. Then, suddenly, it was as if the coyote had something definite to do: its behavior seemed to became more purposeful and directed. The coyote trotted directly, and quite purposefully, over to another edge of the same hill as a woman and her two children appeared on the path below — now the coyote was facing the area from which it had originally come — an area where earlier I had earlier seen two coyotes: this one and another one. Had this coyote heard something from this direction? The coyote curled up, ignoring a woman and her two children who had appeared. At first I thought the coyote had moved to this side of the hill to keep an eye on this woman and her children. But I could see that this was not the case. When the coyote re-positioned herself, these people were totally out of the coyote’s visual field. I’ve never seen coyotes interested in people. I waited, noting that the coyote kept looking in the direction where I had seen it earlier. It relaxed between looking. After about ten minutes, it bolted to an upright sitting position, and had its eyes glued piercingly on something in that location — a considerable distance away. It leaned into the direction of its gaze, eyes riveted, ears high and focused forwards. It remained like this, totally still, for well over a minute. The coyote definitely was looking at or listening for something, or maybe it had already spotted it. I myself could see nothing whatsoever. Whatever the coyote needed to know suddenly clicked, because it then hurried off, at a quick lope, not quite a run, towards the area where I had seen two of them earlier. This same type of hurried and purposeful departure had occurred before, in almost the exact same manner. A lot was going on here! There was forethought, planning ahead, assessing. There was casualness, and there was quickness when this was deemed important, there probably had been communication over the distance, there probably had been worry. There was knowledge of locations and of situations. Coyotes have keen senses. At long distances, they can hear incredibly and their eyes can see both ear positions and behavior of other coyotes – this is how they communicate. I myself can only see this with a zoom lens. So, the coyote hadn’t aimlessly chosen this spot to sit, and it hadn’t just whimsically decided to depart. The spot was carefully chosen, as part of a plan to keep track of family members: a place where they could be heard and seen. First the place was “scoped” and “assessed”, for what dogs might be around. Dogs are the coyote’s primary concern in our parks. And when the coyote finally departed, dashing off, it was not done whimsically, but as part of a plan. Something didn’t seem right to this coyote, so off it went to be there: maybe it felt that its dominant presence or its help was needed? A coyote might resemble a small German Shepherd when you first spot it. Western coyotes are relatively small, averaging about 25-30 pounds, with a 26″ height and a 5 foot length including the tail. The tail, which is a key distinguishing characteristic, is very full and cylindrically shaped and is not normally held up high: rather it is always lower than horizontal. The tail ends in a black tip. Coyotes are tri-colored, including white, black and brown — the brown runs from reddish to yellowish. Their over-all look from a distance ranges from brownish to grayish, and they often have distinctive patterns of color on their backs, but always with variations of a black and white fan-shaped stripe across the upper-mid back. A coyote has a thick undercoat plus outer weather guard hairs. In the fall and winter coyotes gain a much fuller coat which make them appear larger than they do in the springtime, when they can look very, very thin, after loosing these winter coats. The coyote’s underbelly, inner legs, and chest area in front of its front legs are white. Compared to dogs, coyotes have a much longer snout, they are very thin and lithe. The long, thin snout may help them retrieve gophers and voles from burrows — I have actually seen a coyote “dive” head first into such a hole after the rodent has stuck its head out. Their thin and lithe bodies make them very quick. Cheek fur actually makes the coyote’s face look wider and emphasizes the thinness of the snout. The coyote’s bones, tendons and muscles are made so it can run after prey, leap and twist when pursuing quick moving small prey, and lope a long period of time without tiring. Their high intelligence, aided by their very keen senses — hearing seeing and smelling are very acute — has helped them survive in the wild and adapt to entirely new environments. They use their ears, which are triangular shaped and point up, to communicate with each other. Backs of their ears are a rusty red. They have yellow eyes, which can see in very dim light. Coyotes are very secretive and and are very evasive, which is why most people don’t see them. They are naturally fearful and cautious of humans. However, you may see a bolder one right out in the open, quite unconcerned, maybe on a hillside. They keep their dens well hidden, keeping several of these as alternatives. This way, when fleas build up, or if the coyotes feel a threat is nearby, they move on to one of their other dens. They dig these themselves sometimes, but sometimes they just fix up hollows which they have found. Only 5-20 percent of coyote pups survive their first year. The coyote’s front footprints can be distinguished from that of a dog, because its two middle toes actually point inwards, compared to those of a dog. Coyotes walk only on their toes! Coyotes have the same teeth as dogs: four canines for holding on to prey. The teeth behind these, the premolars, are used for tearing prey. And they have molars for chewing, but these are not used frequently by coyotes unless they need to crunch bones or nuts. One thing I’ve noticed is that a coyote’s tongue is very long and maneuverable — possibly more so than a dog’s: a coyote can curl its tongue way out, encircling its nose! Coyotes in desert areas are active during the cooler early morning and twilight hours. In mild climates they are active during daylight hours. When food is plentiful they might hunt at night, sleeping during the day. All of these alternatives have been noted in San Francisco. Coyotes yip, bark, huff, yelp, whine, whimper and howl: these are quite high pitched compared to a dog’s bark or a dog’s baying. Coyotes may engage in these vocalizations for a considerable period of time — sometimes 20 minutes or longer. No dog bark will ever sound like the high pitched and continuous bark of a coyote! I’ve mostly seen coyotes hunt alone. But I did see two females dig at the same spot. It could have been that they were working as a team: one digging at a burrow, the other waiting for the rodent to emerge. Coyotes are opportunistic eaters, which means they will adapt their eating habits to food in the area. They eat small rodents, insects, reptiles, fruit and berries. Several of them will prey on larger animals, such as deer, when the rodent supply is down or in hibernation. Aggression should be addressed here. Coyotes are not particularly aggressive animals. Most coyotes pose little threat to humans. However, they will defend themselves against dogs if they are chased or interfered with — defending and aggression are not the same thing. One needs to look at statistics to really understand the minor extent of danger to humans: as of this posting, there have been only two human deaths from coyotes ever reported. These were bizarre anomalies. Dog bites, however, including from one’s own pets, are in the tens of thousands, and deaths from dogs are in the hundreds. The relatively few coyote aggression incidents have mostly occurred in Southern California where they have been linked to feedings, even if the feedings were unintentional. Please, never feed or try to tame a coyote: feeding them has been isolated as the source of their aggressiveness towards humans. Once they have been fed, they begin pursuing humans for the food they think is owed to them. Also, please keep your dogs leashed in coyote areas, both to protect the coyote and your dog! Today I had the rare privilege of seeing a coyote family together. Since most people have never even see one coyote, I feel very lucky. Previously, I had spotted these coyotes individually, in the distance, only very briefly and only a couple of times at all this fall. I had been able to establish ages and relationships by observing when young ones first appeared. And I have seen a couple coyotes interact. But today I was able to see this entire unit together, not for long, but long enough to witness some interactions. The day began with a pile-up of affection, literally! As darkness turned into barely distinguishable shadows, the mother coyote materialized on a hill out of the darkness. She was sitting to begin with, but then lay down. I’ve noticed that she places herself in locations where she can take in the entire scene with one glance: after all, she is the mother of the other three and still looks out for them. A few moments after she lay down, her yearling male full-grown pup trotted down from higher on the hill. He curled up in a ball about 30 feet below the mother. Then, barely discernible, two more coyote pups became visible — at first only the movement of their white parts could be seen in the dark. These would be the two pups born this spring, now full-sized coyotes, but often very puppy-like in their movements and behavior. They shook their heads, and joyfully approached their mother, climbing all over her and nuzzling her in one big happy pile-up: in the twilight it looked like a bundle of wiggling worms! At this point the yearling got up and approached within about 5 feet of them — the whole family was right there together, but it was too dark to take a photograph — even at 3200 ISO the camera would not function. The yearling trotted back to his previous spot where he curled up again. He has always been the shyest of the bunch: when humans are around he situates himself far away and close to a brush area into which he could escape, but not today. Today he was curled up out in the open. By 6:36 the twins born this year began making themselves busy: separately and cautiously they came closer to the dog that was with us — an uninterested dog. But they soon lost interest because of the dog’s lack of response, or maybe because his eyes said to stay away! Coyotes keenly pick up this sort of visual clue. After a few minutes, these twins came together, and together went towards their mother — they began digging, side by side — they seemed to like being in contact with each other. Their mother remained lying down, closing her eyes at times. By 6:50 the brown twin headed off, quite deliberately into the far distance, but then seemed to change its mind and turned back. Then everything suddenly became totally still, as everyone’s attention became riveted on two dogs and their owner, very far off, but distinguishable. All coyote eyes turned in this direction, and all activity stopped. Just as suddenly as these potential intruders appeared, they departed, and all of the coyotes relaxed. Some of the coyotes have allowed me to observe them a couple of times lately . They keep a cautious eye on me. I stay as still as possible. When I move, I move slowly. I have noticed that if anyone else comes up as I watch, the coyotes run off. This time, since the possible intruder was so far off, the coyotes just became very still and watched. By 7:00 the twins and then the yearling had moved a considerable distance away, so I went down to observe these three, but soon they had slithered into the brush area. Ten minutes later I was back up where the mother was. She got up, stretched and yawned, and moved down the hill where now two of her pups could be seen again: the yearling and the brown twin. And then, something new happened. At 7:10 the yearling headed, very decidedly, towards his mother who was sitting. He passed right in front of her, apparently walking right under her chin — was this a sign of subservience before taking the lead? Only dominant females become mothers. He continued his quick gait as she watched, and then she, suddenly, took off after him, following, and so did the brown twin, right behind. Was he calling the shots at that moment? I don’t know, but it looked like it — incipient leadership maybe! Maybe he had asked the mother to come see something he had heard? The three arrived on a knoll and sat down together before the mother took over the leading. She proceeded down the hill and out of sight with the male following her this time. The brown twin remained sitting there. I decided to walk around a grove of bushes to see if I could tell where the two had gone, but I didn’t find them. When I came back to where I had last seen all of the three coyotes, the brown twin was still there, keeping its eye on an area where, I found out, her brother and mother had gone. Soon this brown twin slithered into the brush, so I went to the place where it had been looking. I was told that two coyotes had just given a casual chase to a poodle who they encountered in their path. Dog walkers and dogs had cleared the area. I found the mother coyote happily eating grass in a corner of the area — she did this for 6 full minutes. There was no more sign of the male yearling. After not too long, this mother wandered up into a thicket where she sat down and watched in my direction for about five minutes — I think she was looking past me to the path where there were people noises and dog walkers around. One dog eventually got whiff of her — he was suddenly up in her area looking for her. He found her and chased her. The coyote sped off, and then sped right back: at first appearance the coyote seemed to be chasing back, but looking more closely, I think it is more likely that the coyote wanted to claim the spot where she had been — once she returned to that spot, she ran no further after the dog. The owner then was able to grab his dog — this coyote seems to understand when a dog is restrained from chasing her, probably because she can read the change in the dog’s behavior: his activity level changes entirely. As 8:00 approached, the coyote wandered up through the thicket and up a hill where a group of five spectators witnessed a hunting scene for seven minutes: the coyote was cocking her ears, twisting her head, moving her body around at different angles, and finally plunging head first into a hole — with no result. She continued her activity at that spot, digging and stretching her body out over the area before giving up. I want to add here the affection I saw the day before this. This involved affection between the twin pups born this year. The silver twin trotted over to the brown one who was on a path and put her neck over the brown one’s neck in a kind of hug, and the brown one nuzzled back. This didn’t last long, not long enough to photograph. Then they stood there together observing us and a dog. The brown one then moved further off — this coyote tends to be shyer. Questions I have: was there a message of dominance between these siblings? Was there a message to move on? These are possibilities I’ll keep in the back of my mind — if and as they recur I’ll be able to decipher the behavior better. On this same day I watched a coyote chomp down some crackers that had been left out. I’ve seen crackers deposited here before and always cleaned them up. But on this particular day, a coyote was right there chomping away. This coyote tightened up when it saw me, but because I didn’t approach, it continued its feast until the food, all but two crackers, was gone. I photographed what remained to show what kind of food was left out. On most days, the coyotes can go about their day without ever being seen: they probably keep to the brush areas and to the lesser peopled areas. But on some days people have seen them right out in an open field, either hunting or lying down. I thought I should let people know where I am coming from, and why I am interested in coyotes. This particular activity opened for me two years ago when I met my first coyote on a walk here in San Francisco. At the time, my habit was to get up before dawn and take an hour-and-a-half hike up to the center of our city — always with my dog. Dawn is a great time of day. The world is quiet, it is peaceful. The world belongs to you and to the wildlife which is beginning to stir again after a night’s rest. There is a magic about it, especially as you climb the hills, with all the bright lights below looking something like Christmas, Diwali or Hanukkah, or looking like the approach to a city from an airplane. Two years ago, during my morning walk, as I was rounding the bend of a path, what should I see on the trail in front of me but a coyote, a young coyote. Right in the middle of a city. In a large, hilly park-like area. Coyotes were just returning to the city after many years of absence -– we had heard of only a couple of them in the newspapers, so the surprise was overwhelming. This coyote was so excited to see us, me and my dog. It did not run off. It did keep its distance. It bounced up and down, up and down, like a ball. It ran down the path and back, and down again where it lay, sphinx-like, watching us until its excitement made it get up and repeat the bouncing. I sat on a rock, mesmerized, with my dog next to me. For 20 minutes we watched the coyote, and the coyote watched us. I didn’t have my camera that day, but that would never happen again. Exactly a month later, we ran into the same coyote. This is when I started taking photos. The photos were less of the coyote, at least in my eyes, than of the coyote’s behavior. I actually started photography as a record-keeping device: I was interested in character, personality, behavior, motives, etc. The first coyote I met had offered a little of itself to us — I needed to find out more. So, this is what I do now for a few hours each day, most days: during my walks, I observe and photograph urban wildlife, mostly coyotes. But I have always been around animals, both my own pets and wild animals that were injured which I took care of and released as soon as possible so as not to rob them of their wildness. The exciting thing about animals for me has been not only their wildness: their ability to do everything necessary to survive on their own, but also their rich emotional lives: they feel with all the intensity we humans feel. All species, I have found, have a culture in common, and a culture apart from us humans. We share a lot with them, and we are different. If we observe them, and if we are interested enough, we can understand them — the same way cultural anthropologists do, the same way Jane Goodall did: understanding individual animals through empathy. My special interest has always been coyotes, though I watch all animals. After lots of observing, nuances take shape and you begin to be able to read a few things that you could not read before. I have probably spent hundreds of hours in the parks, watching them — using my camera to focus my attention, and then reviewing at home. My camera is like a notebook for me. What I have learned regarding the coyotes is that these are individuals, that generalizations might not necessarily hold. Watching coyotes is like watching the same dogs in a park for a while: you get to know certain things about them — they each have their personality quirks. Does one dog have more in common with the other dogs or less? For each individual animal it is different. For the most part I know what a coyote is doing, if it is busy or not, that they are communicating. I was aware when one tested me. I know they can “read” most dogs and can assess each individual dog from a distance. They keep a safe distance from people who they also assess — either cautiously trusting them at a distance, or avoiding them. I know how important the coyote family unit is — I’ve seen them greet one another, I’ve seen them work as a team, I know that a mother will protect her young, I’ve seen a yearling act as a sentry and warn a mother if an intruder is coming her way. I know food is marked as foul by urinating on it. I know what dog activity upsets certain coyotes, which coyotes are shy, which ones are more curious or daring. I can tell them apart by their facial features — mostly — at least at certain times. I have seen a barking coyote look out of the corner of its eye, to see how it is affecting an onlooker — I could see that part of this is bluff. I have been allowed to be on the same side as a coyote when a it was chased by a dog. And there is so much more to become aware of — I’m just beginning to scratch the surface. 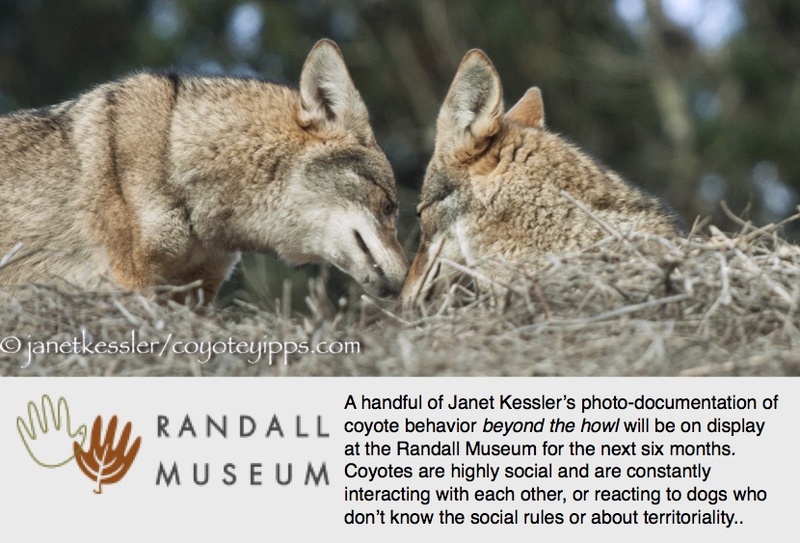 I am getting to know the behavior of individual coyotes, and I am making sense of it all. Other things about myself: I grew up in South America. My husband and I live with our 15 year-old dog in the center of San Francisco where we have been for over 30 years. We have a front yard garden where we grow corn (200 ears a season) and have an apple tree which gives us over 300 apples a season. We have grown wheat which we made into sprouted wheatberry bread — nine full loaves, we succeeded with one cotton plant — it produced one boll — we were able to make one Q-tip!, we have tomatoes sometimes. We have two grown sons who live in the Bay Area. We both love the urban environment and our walks. I took up the harp when my kids went off to college. Please see article in The New York Times which appeared on March 14, 2010: Taking Walks on the Wild Side. At 6:30, before my camera would even operate, a coyote appeared suddenly below the path, fairly close. I think it had come in my direction because of a dog — a calm dog who does not chase coyotes. It sat on the slope of the hill, facing downhill, and looked at us over its back. Then, within only a few moments, it ran off into the brush. About five moments later it re-appeared again much further down the hill. We walked around to this area, a 10 minute walk, to find the coyote still sitting where I had last seen it. My walking friend and dog departed and I stuck around for the light to get better as the day progressed — maybe I would get some photos before the coyote slithered into the underbrush. The coyote had been resting here for about 15 minutes. 7:30-7:43 sits up and is “on the lookout” because a group of walkers and dogs have approached. These are dogs that have chased the coyote in the past. I am asked if the coyote is around and I nod. They see the coyote, then leash up. The coyote hurries up to be closer to an escape route, but remained in view. After the group has left, the coyote returns to its former resting spot. 8:38-8:42 it stalks a cat, initially staring at it and then moving ever so slowly and quietly towards it — “cat-fashion”, and then suddenly dashes in. Cats are too fast for coyotes to catch unless they are old or ill. The cat easily lost the coyote. 8:45 the coyote urinates and continues on, wandering in an easy manner. I noted a lot of scratching during this time frame: at 7:12, 7:33, 7:43 and 8:19. I saw Jacob again this morning. He has a sheep-dog who is super sensitive to reading other animals. Jacob wanted to let me know of a coyote encounter he had had a few days earlier, an encounter which was closer and therefore somewhat disturbing compared to previous coyote encounters he has had. In the past, he and his dog always passed the same coyote at a distance, the canines would eye each other, and both would become alert to the other’s presence. The coyote might stand up if it had been resting — this is one of the dogs that is much too alert to be yawned at as it passed. The dog also is an enthusiastic ball retriever, which means it has spurts of high energy and activity. Alertness and high activity are clues that the coyote is in-tune with — this type of dog has pursued her in the past, even though this one specifically has not. On this particular occasion it was foggy and quiet and there was no one else around. Jacob’s dog was ahead of him, when Jacob felt he was being followed. He turned to see one coyote following him pretty closely, maybe at 20 feet, and he noticed there was another coyote further back. As Jacob immediately called his dog to him, his dog noticed the coyote. The dog, now between Jacob and the coyote, walked towards its owner, ever so slowly and carefully, walking backwards, keeping its eyes glued on the coyote. This eye contact may have been seen as a challenge by the coyote. At this point the coyote backed up a distance, ran up a tiny incline and began scratching the ground with its forepaws and rearing up — a display used to keep the dog away, to keep it from following through on its eye-contact challenge. The coyote’s purpose was to look intimidating — and for the most part it is effective. The other coyote disappeared into the brush. The coyote’s activity didn’t last long as Jacob walked off with his dog. The two coyotes ran off. Coyotes have sometimes followed walkers the entire length of some park, sometimes at a further distance, sometimes at a closer distance. Curiosity, sizing the dogs up, desire for contact, maybe even a bit of challenge are all possible explanations. It is always best to create distance when you don’t know what is going on. Jacob did this by calling his dog and then facing the coyote before moving on. Please see posting of December 7th: “Dog Reactions to Seeing a Coyote”, November 4th: “Some reactions to dogs”, and December 1st: “Significance of a Seemingly Unprovoked challenge”. Also, please see the entry on “Coyote Safety” of 11/3. “Blatant Visual Message for Newcomer Dog” of 2/8/10. “A short back-and-forth chase: oneupmanship verging on play” of 2/4/10. I met Hervé with his young Rottweiler today in the park. He wanted to know if I had seen any coyotes — he has seen me photographing them. He wanted me to know that his dog had had two encounters with the coyotes recently, very peaceful ones. He said he had seen a coyote right in the open during the day, that the coyote had come up to his dog and sniffed its rear end, then departed. I asked him how his dog had acted around the coyote, and he told me that his dog was uninterested. This is a pattern I am finding. Seldom if ever do coyotes approach a dog who is right next to its owner. However, a couple of times I have seen a calm dog, which has been allowed to wander off a bit, actually greeted by a coyote which is nearby — usually with a brief sniffing before taking off. These dogs are calm and uninterested in coyotes, dogs who mind their own business and are not out to pursue the coyote. It is the dogs that pursue and chase the coyotes which are the problem. Coyotes are even aware of the leashed dogs who lunge in their direction. The other day Hervé had heard a coyote barking loudly, while a woman yelled ineffectively for her dog to come: this was obviously an incident of a dog chasing a coyote. A coyote will defend itself when chased. Most often the coyote will react by barking, but there have been several instances of the coyote pursuing and nipping at a dog’s haunches to get it to move away from itself. This defensiveness is as close to aggression as the coyotes have ever gotten in our parks. We have very peaceful coyotes in our area. We then talked about the group in the park who have been throwing stones at the coyotes and yelling at people who get close to them, claiming that habituation leads to aggression. He was very puzzled: “Why would habituation lead to aggression?” I told him that I had contacted one of our premier coyote behaviorists who said “It doesn’t, habituation does not lead to aggression.” Very few coyotes ever become aggressive at all. In an urban setting, coyotes are going to get accustomed to having people around — that is the nature of the situation. What does cause aggression is feeding. Feeding is at the root of all aggression and has to be absolutely avoided. Hervé gave me some insight into this. He told me about shark and grouper behavior when they are fed. This information seems quite relevant to our coyotes. He is a scuba diver. He told me that groups of people, usually on tours, actually feed the sharks — sometimes by hand — to attract them. The sharks have gotten used to this, and have come to expect it. But, then, when a different group of people come by that don’t feed the sharks — they don’t know that the sharks now expect to be fed — the sharks actually pursue these people for what they have come to expect, and they do so aggressively. Groupers are known to do the same thing. In this manner, feeding leads to aggression. This type of occurrence is common knowledge among scuba divers, he told me. This might be exactly what occurs when coyotes are fed. This is the sequence that people have to know about. Never ever feed a coyote. Feeding coyotes is the root of all aggression towards humans.